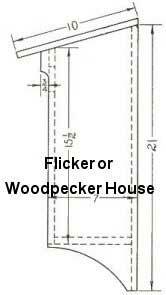 2 flicker bird house plans to choose from. 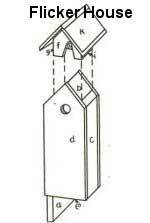 Click on the picture below to go to the Flicker bird house plans. If you're unfamiliar with a Flicker, it's probably because you know this bird as a type of Woodpecker. From Alaska to Central America, you'll find some variety of this medium-sized, insect-eating bird. This bird prefers cavities in stumps or trees to build their homes, so creating a deep nesting box with the access near the top is something the Flicker will favor. You should mount the birdhouse from 6-feet to 20-feet above ground, as that's where the Flickers feel most comfortable and secure. Mounting the Flicker bird house well before mating season is a good idea for the wood to weather and the birds become accustomed to seeing it on your property.